How will online services benefit me? Submit invoices online and get paid within 3 business days - using our online services is the most efficient way to send multiple invoices for processing. Receive and accept or reject referrals quickly and easily online (for return to work service providers and job placement service providers). Submit documents online such as medical reports, return to work plans and health management plans. Reconcile payments and export them as a CSV file to upload to your accounting software. Receive and modify notifications for key events such as invoices not paid. Check if your patient has a current claim. How do I login to online services? Click the 'Login' button on the header of our website. You can also directly access the login page at login.rtwsa.com. Click the ‘Register here’ link on the login page at login.rtwsa.com. Note: If you are a new user please check that your provider number is registered with us by contacting us on 13 18 55 or prov.main@rtwsa.com. What if I have forgotten my username and/or password? Your username is your email address. If you have forgotten which email address you used to register, please contact us on 13 18 55 or premium@rtwsa.com. If you have forgotten your password, click the ‘Forgot password’ link on the login page at login.rtwsa.com. Alternatively, please contact us on 13 18 55 or premium@rtwsa.com. Do I need multiple accounts if I work across multiple providers? No. 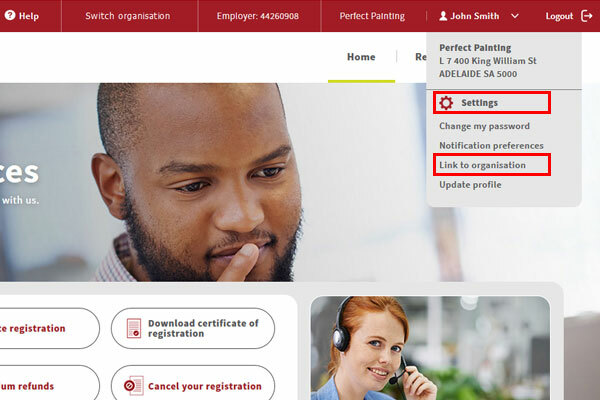 You can manage multiple organisations, including provider and employer functions, under one account. How do I link another organisation to my account? If you need to link another organisation to your account, you can do this through your settings. Click on your name on the toolbar, followed by ‘Settings’ and ‘Link to organisation’. Follow the prompts to add an organisation to your account. This link is activated subject to authorisation. You will be notified of the outcome via email. Our online services work best in the latest versions of Chrome, Firefox, Safari, Internet Explorer and Edge. You may experience issues if using older browser versions. We recommend upgrading your browser or using an alternative. Can I bulk upload invoices? Yes. You can bulk upload invoices in CSV format as a CSV or TXT file. How long does it take for invoices to be paid? By submitting invoices through our online services, you will be paid within 72 hours (3 business days), provided the claim has been accepted and the data items required have been provided. Can I reconcile payments online? Yes. You can reconcile payments in real-time in Payment history. Will you still send me a hard copy remittance advice? No. Remittance advices will be available for view and download from our online services in Payment history. Can I check if my patient has a current claim? Yes. You can search by claim number or patient details to find out if your patient has a current claim. What types of documents can I submit online? Will more features be added to online services? Yes. Our online services will continually be reviewed and improved to provide you with a better way to do business with us. Contact us on 13 18 55 between 8:00am and 6:00pm Monday to Friday or email info@rtwsa.com. To ensure we provide a better service for you, we would like to hear about your experience using our online services. If you have any suggestions or feedback, please contact us on 13 18 55 or info@rtwsa.com.